Michael Baraniecki turned his second 9-0 start into his first Grand Prix title, using Fling to stun Eli Kassis in a thrilling final. “I went 1-5 last time. I think I can do better.” That was what Michael Baraniecki said after going undefeated on Saturday. He did a little better than average on Sunday by drafting Amonkhet—for the first three times—all the way to the finals in Richmond. Defeating Eli Kassis’s controlling deck with an unexpected Fling to the face, Baraniecki’s teammates roared as he claimed the title. These two players in the finals weren’t the only to make the most of the weekend. Evan Esposito and Josh Jones added Grand Prix Top 8s to their Magic resumes. Brad Caprenter and Thiago Saporito put the second Grand Prix Top 8 in his books. Martin Dang played out an incredible third game against his quarterfinal opponent: 24th-ranked Brian Braun-Duin. Braun-Duin was on a tear, playing out all of his Swiss matches to notch a 15-0 record before the Top 8 that narrowly ended in a can’t miss moment of the weekend. With the earlier release of Amonkhet through Magic Online, players arrived prepared more than ever to battle with the latest set. 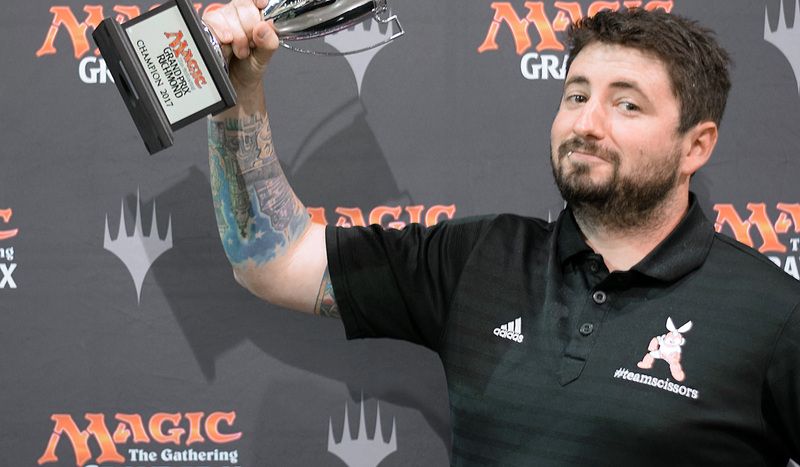 While eyes are turned toward Nashville and the Pro Tour next weekend, the sun finally set on an explosive Limited weekend in Richmond—Baraniecki, now champion of Grand Prix Richmond, saw to that for sure. From nine rounds of Sealed with 1,595 players, just 510 return on Sunday to begin the second wave of the Amonkhet Limited weekend: Draft. While it was an impressive field of pros that descended upon Richmond—Hall of Famers and Pro Tour champions abounded—the leaderboard at the end of Day 1 was filled with fresh faces too. Michael Baraniecki, Kyle Thiele, (18) Eduardo Sajgalik, Devin Koepke, Dylan Gellis, (24) Brian Braun-Duin and Robert Coffman (pictured above, left to right) might have the narrow lead now, but drafts close gaps fast. Players such as Justin Cohen, (10) Joel Larsson, and(13) Alexander Hayne are chasing right behind for their own chance at Grand Prix glory. When the sun sets on Richmond tomorrow, only one player will complete the final trial to become a new champion. For now, this crop of Amonkhet players rest. Join us for live coverage beginning at 9 AM EST (6 AM PST; 3 PM GMT) all day long at twitch.tv/magic! The hashtag for Grand Prix Richmond is #GPRichmond. Join the conversation!